I find it funny how sometimes fabrics languish in your stash for years, and others skip the queue completely and get whipped up fresh from the pre-wash. Often I find I’m much less precious about cheaper fabrics, and willing to merrily hack into them without weighing up all the options of what it might want to become. So it was with these two frocks, both made from recently purchased cheap fabric, and both self-drafts from my blocks. I’m a bit smug about this first one. 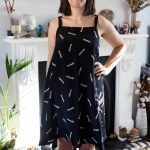 This delicious viscose cost £3 a metre and I was alerted on Instagram that Whistles is using exactly the same stuff for a £110 dress – am I ever glad I can sew. Amy and I both grabbed some of it from Fabric Mart in Walthamstow when we did a super fun little fabric crawl afternoon a couple of weeks ago. 1. Rotate the front bodice shoulder dart into the waist dart, and convert some of the dart fullness into ease. 2. Convert all of the back bodice dart fullness into ease, and cut the V-back. Add on the extra width for the button placket at the centre back. 3. Skirt is two rectangles, gathered onto the bodice with elastic. Done! This was an evening’s project from drafting to finishing, and it’s already become one of those dresses that I’m always reaching for and rushing through the laundry so I can wear it again. Love the fabric, love the length, so pleased the button-back detail worked out. I’ve saved the pattern to use again for the next perfect fabric to come along. 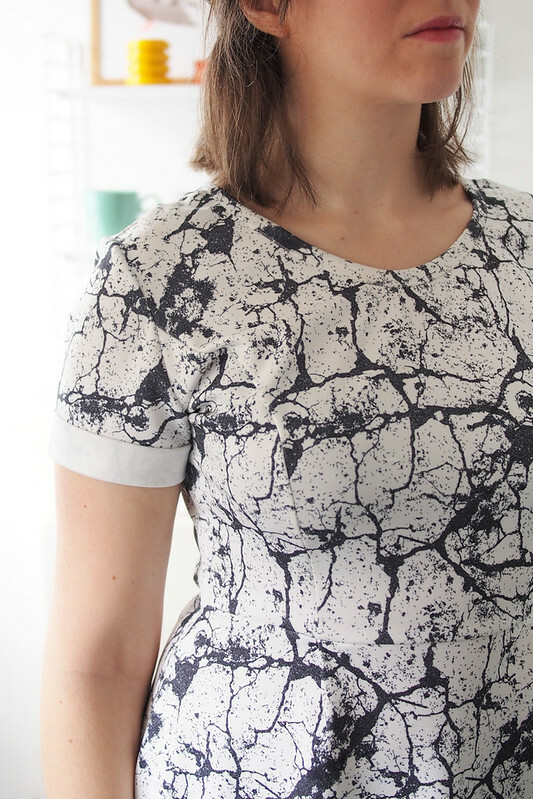 The second one uses some excellent marble-print scuba from Saeed’s Fabrics also in Walthamstow. I even overlooked my usual aversion to white because it’s just so cool looking. I used my princess seam bodice block, and the skirt has soft pleats in the front and gathers at the back. I scooped out the back neckline here too – I think it adds a certain daintiness. The fabric was fun to work with – it’s quite a light scuba, probably about the weight of ponte but definitely scuba-y: it even smelled like wetsuit when I steamed it. I overlocked all the seams, and used Megan’s technique for neckline binding. The hem is left raw since it seemed to hang nicely and won’t fray. By the way, I’m not doing Me-Made May :( work is so busy at the moment and I don’t really feel like documenting what I wear every day. But I’m on a good 80% at least me-made days lately anyway, and I’ll just enjoy seeing everyone else’s posts! Ooh, both are a REALLY nice – I especially like the buttons down back. Also, that sewing machine looks fab. Ah yeah isn’t it sweet, it’s a vintage toy one I found in Paris. Not sure if it works! You are really good at self-drafting. Both dresses are gorgeous but the white one is Awesome – what a great fabric! The funny thing is that I bought some fabric from Saeeds a few weeks ago but did not spot this fabric. Like you, I have an aversion to white but this Scuba is exceptional! It’s good isn’t it, definitely wearable despite the whiteness! Both are nicely done! I am partial to that first one though, both the fabric and the design. I had to laugh at your button love! I am the other way. I avoid buttonholes only because there are issues with my machine which I need to get looked into! Ah I love them, my machine has quite a reliable one-step buttonhole which helps! I’m going to share a bit of a tutorial soon, maybe it’ll help! Wow! Both are amazing! I especially love the scuba one! I can see how you would get a ton of wear out of the back-buttoned dress, and wow, I’m so impressed that you went from draft to dress in a single evening! The dress is really lovely, and yes, all elements look perfectly wearable + interesting. I’ve been thinking about working up something similar, but wondered how the buttons would feel after sitting in an office chair all day. Seeing as you haven’t mentioned a thing about any discomfort there, I’m excited to give this a go! Thanks for the inspiration. Oh no, I don’t feel anything at all – there’s the layers of the two buttons bands so nothing digs in. Go for it! It’s an extremely easy fabric to work with! Ooh! These are both gorgeous! Love both prints, especially the cool scuba! I LOVE that scuba print! Definitely heading to Walthamstow next weekend to see if it’s still there. I’ve never sewn with scuba material before but I do love the volume and structure it can create in a garment. Very adorable, the second dress is too die for! Love both dresses but the scuba one is a total stunner. Love the fabric print, I want it too!! The white sleeve detail is perfect!! You are so clever! Thanks for explaining how you modified your block so clearly, if I’m feeling adventurous I might try that sometime, since I do have my own blocks languishing under my sewing table (usually overlooked for something shinier, prettier, etc). That viscose is dreamy. Hope you go for it, it gets easier with practice. I love both of these! 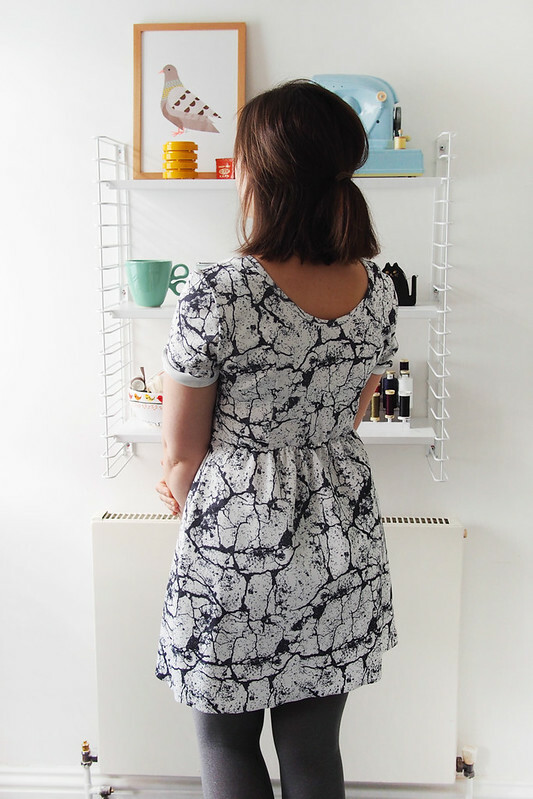 You always make me want to sew more dresses! That scuba looks really cool! Two awesome dresses here Katie. I love the button details on your first dress and agree with other posters that the scuba is a super-cool print x Nice work on the self-drafting there too. 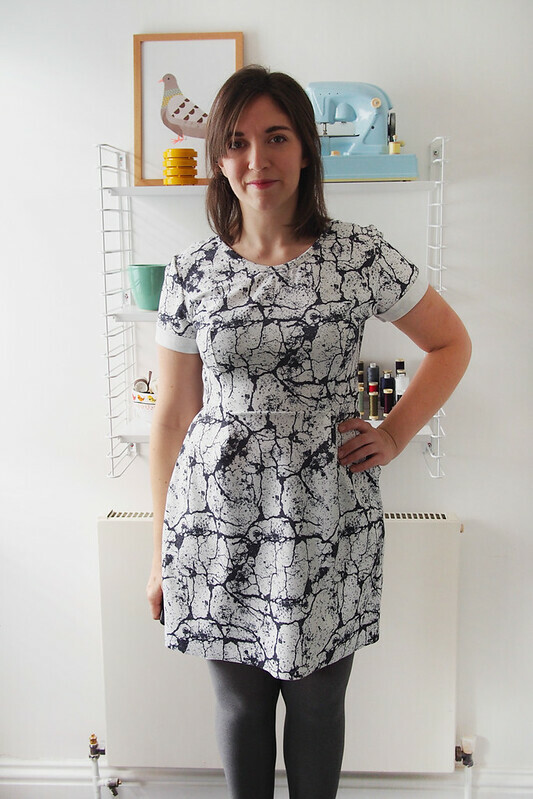 I have yet to make the dress I ‘copied’ from a Ray Stitch class last month. I’m searching for the perfect fabric first. Gorgeous dresses and they both look so comfy! I could see how you would want to wear them non-stop! Thanks! They really are super comfy. I love both these fabrics. I know Saeeds, and thought I knew all the fabric places in Walthamstow, but can’t place Fabric Mart? Is it in the High Street? Yes, it’s closer to the tube than Saeed’s on the same side of the road. I think it was called Fabric Mart – Turkish people running it. These are both lovely. 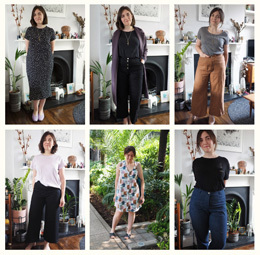 I especially like the first one – a whistles dress for under £10! Thanks for those bodice sketches… I like the button downed back piece! I have some scuba that is a fantastic print, and I haven’t worked out how to use it yet… I’ve read it doesn’t work well with darts! And so I might have to copy a few bodices to find the right fit for it. 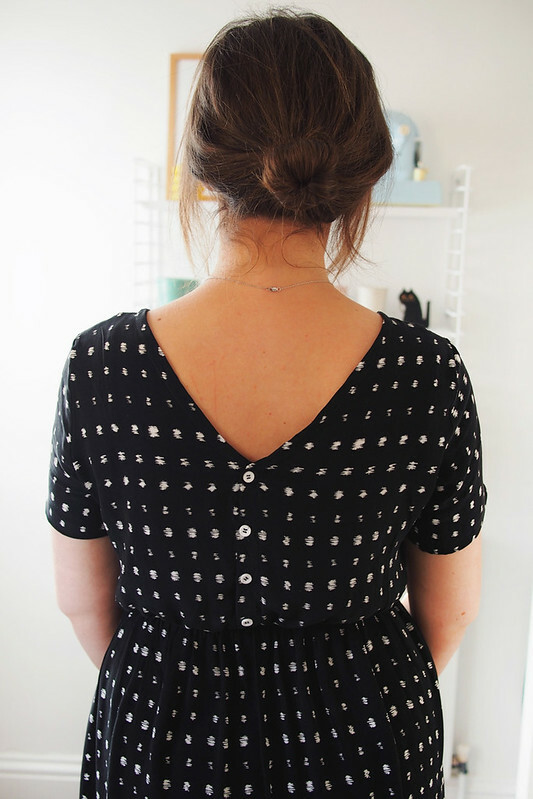 Both your new dresses look fab – I love the back button detail on the black one! I need about ten of each of these in my closet…. Super job!